The versatile Ernest Richardson is in high demand as conductor, composer, arranger, organizational leader and inspirational speaker. His versatility finds him within one season conducting Stravinsky's Firebird Suite or Broadway artists in the works of Leonard Bernstein, a live-to-movie production of Harry Potter, facilitating strategic decision-making for leading arts organizations, or training young musicians for the passionate, persistent pursuit of perfection. He has been at the forefront of symphonic video/live music productions, conducting live-to-movie scores of the Harry Potter series with CineConcerts, Indiana Jones and the Raiders of the Lost Ark, Jurassic Park, Back to the Future, Pirates of the Caribbean, Singing in the Rain, Casablanca, Ratatouille, Star Trek (2009), the Charlie Chaplin silent film The Gold Rush and most recently Star Wars: A New Hope. Richardson is presently the principal pops conductor and resident conductor of the Omaha Symphony at his appointment in 2015. Since 1993, he has laid the groundwork for and led in the development of the Omaha Symphony’s vaunted education and community engagement programs. In addition to his artistic leadership in the creation of the annual sold-out Christmas Celebration production and internationally performed "Only in Omaha" productions, he leads the successful Symphony Pops, Symphony Rocks and Movie Music Series. The highly successful Family Series was created under his artistic leadership and he is one of the visionary forces behind the new and innovative Symphony Joslyn Series. As chief architect of the Omaha Symphony’s education and community engagement programs, Richardson has been at the forefront of crafting the vision for the programs and their impact on the community. The pivotal point in his leadership can be traced to the first education report written in the beginning of his tenure with the Omaha Symphony. This report paved the way for the structure, function and programming of the education department leading to innovations in all programming including the creation of Choral Collaborative, Celebrate Creativity, Music Alive!, the Family Series and Mission: Imagination. Richardson is presently the principal pops conductor and resident conductor of the Omaha Symphony at his appointment in 2015. Since 1993, he has laid the groundwork for and led in the development of the Omaha Symphony’s vaunted education and community engagement programs. In addition to his artistic leadership in the creation of the annual sold-out Christmas Celebration production, he leads the successful Symphony Pops, Symphony Rocks and Movie Music Series. The highly successful Family Series was created under his artistic leadership and he is one of the visionary forces behind the new and innovative Symphony Joslyn Series. As chief architect of the Omaha Symphony’s education and community engagement programs, Richardson has been at the forefront of crafting the vision for the programs and their impact on the community. The pivotal point in his leadership can be traced to the first education report written in the beginning of his tenure with the Omaha Symphony. This report paved the way for the structure, function and programming of the education department leading to innovations in all programming including the creation of Choral Collaborative, Celebrate Creativity, Music Alive!, the Family Series and Mission: Imagination.Richardson holds the position of music director and principal conductor of the Steamboat Symphony Orchestra in Steamboat Springs, Colo. Under his leadership this organization has grown from a community orchestra to a resident professional orchestra. As one of the up and coming orchestras in the Front Range of Colorado, the Steamboat Symphony attracts the area's finest musicians. Audiences continue to grow with each concert heralded with standing ovations and standing room only houses. Recent guest conducting engagements include the Rochester Philharmonic Orchestra in Star Wars: A New Hope in concert, Houston Symphony in a performance with singer/songwriter Michael Cavanaugh, the Florida Orchestra and the Phoenix Symphony. He has also conducted with the Nashville Symphony, Fort Collins Symphony, Battle Creek Symphony, Colorado Symphony Orchestra, Jacksonville Symphony and Cheyenne Symphony as well as Opera Omaha. He has been guest conductor and clinician for regional and all-state orchestras in Arizona and Nebraska, the Phoenix Symphony Guild Youth Orchestra, Omaha Area Youth Orchestra, Steamboat Symphony, Santa Barbara City College, as well as festivals in Albuquerque, N. Mex. and the University of Georgia. Richardson has been lauded for his crossover work with singers and choral ensembles. He is equally comfortable encouraging and training singers on healthy technique and sensitive attention to inflection and the meaning of text. 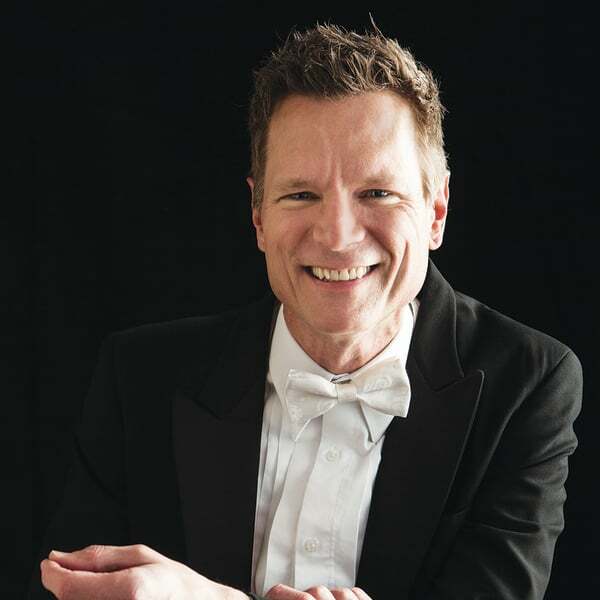 He has worked with countless numbers of Broadway and international opera artists, professional chamber ensembles such as Résonance, the Omaha Chamber Singers, the Opera Omaha Chorus and community choruses Golden Concert Choir, Madrigali et. al, Omaha Symphonic Chorus, Tara Choral Guild, the Steamboat Chamber Singers and Steamboat Festival Chorus of Yampa Valley Choral Society. Richardson conducts annually the 500-voice choir of Choral Collaborative with the Omaha Symphony. A recipient of the 2016 Nebraska Governor’s Arts Award for Excellence in Arts Education, Richardson has encouraged and supported countless young musicians. As the founding artistic director and CEO of the innovative Rocky Mountain Summer Conservatory, the program is based on four foundational principles: the passionate, persistent pursuit of perfection can reveal the extraordinary within us; vision-directed leadership; the musician as athlete; and in all things – balance, which catapulted the program to national attention. Since 1997, this concept has attracted the finest faculty and leading young musicians from around the world. Graduates from the program are teaching, performing and leading arts organizations throughout the country. From 2012 through 2015, Richardson also held the position of music director and principal conductor for the Santa Barbara Music and Arts Conservatory. An accomplished composer and arranger, Richardson composed the symphonic work Three Scenes for Chamber Orchestra, which was debuted by the Omaha Symphony in 2011. His works are featured largely in the annual Christmas production and on many education and outreach programs. His compositions and arrangements for orchestra have been performed by the Neue Philharmonie Westfalen in Gelsenkirchen, Germany, by the Phoenix Chamber Players, Phoenix Symphony, Steamboat Symphony Orchestra, the orchestras of Omaha Conservatory of Music and elsewhere throughout the United States. Commissions for voice and chamber ensemble have been performed by Opera Omaha, the Omaha Symphony and have been featured on the Omaha Chamber Music Society concert series. His credits also include a broadcast performance of his Fall of a Man-made Star composition on Boston’s WGBH. The Lincoln Youth Symphony Orchestra will premiere his chamber work Saying Hello in the Spring of 2019. In addition to his work with musicians, Richardson brings understanding of organizational issues in the industry and provides strategic planning facilitation to a variety of nonprofit organizations. His ability to offer insight and empathy provides the capacity to help each organization clarify and articulate goals, reaching desired and measurable outcomes. Richardson's achievements in Omaha were foreshadowed by his success with the Phoenix Symphony Orchestra, where he began his conducting career. He founded and served as music director and conductor for the Phoenix Chamber Players (1987) and the Phoenix Symphony Baroque Ensemble (1989). Richardson came to the Phoenix Symphony as a violist in 1984, appearing later as a soloist and acting associate principal. In 1990, his talents were added to the Phoenix Symphony String Quartet. While with the Phoenix Symphony, Richardson also served as the musician's ICSOM representative and as the chair of the Orchestra Committee. In addition, he served as volunteer coordinator and acting director of operations for the organization. Richardson began studying the violin at the age of three with his father, Dr. Vernal Richardson. He continued his string education at Indiana University with Tadeusz Wronski, later concentrating on the viola at the University of Michigan with Donald McInnes. He studied conducting with Samuel Krachmalnick and Gustav Meier. While attending the University of Michigan, Richardson also studied composition with William Albright and William Bolcom. An avid fly fisherman, Richardson can be found on trout streams in Colorado and municipal lakes in Nebraska. He has also earned a black belt in tae kwon do. He has been known to help his sons build award-winning pinewood derby cars and craft his own batons. He lives in Omaha with his wife and children. For more information, visit troutmaestro.com.